Ok, I made the last one up, but you get the picture. HS2 is drawn very easily, and probably unnoticed by newspaper readers, into feeding other national discourses (the preservation of nature, the rise of China, the threat of floods). It has become a sort of cipher to pour other things into to make some kind of value judgement possible. In Newspaper world the consequences of HS2 can only be dire or euphoric; the end of the world as we know it, or a new utopia. But the textual nutmegs are sophisticated compared to the visual representations of HS2. The problem for the newspapers is that we are dealing with something that only exists – and then only tenuously – on paper; though admittedly by now, quite a bit of paper. No track has been laid, no stations built, and no trains speed through the landscape. Not much to take a photo of in other words. Apart from the paper. 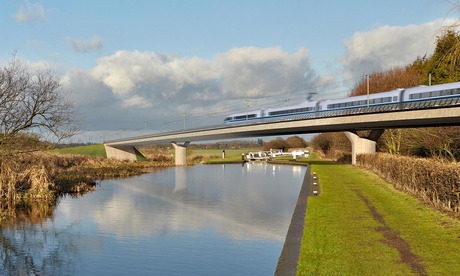 The computer-generated image above, paid for (we can assume) by HS2 Ltd, and which you can see here, here, here, here, and here – oh, and here – has become the most familiar image of HS2, shown over and over again. It is an image that shows the future in a past-infused version of the now. A stonking great HS2 railway makes only a minor difference to the quiet, rural landscape, the image suggests, you might not even notice it as it blurs by. You can barely make out the hi-tension power lines that run alongside the railway against the strategically placed grey clouds. The clean, elegant lines of the viaduct complement the linearity of the canal, which appears much larger than the HS2 line; much more of an intrusion into quiet country ways. The weather is good too; there are the aforementioned clouds on the horizon but blue sky above, reflected on the surface of the water, as is the viaduct (though curiously not the train). There are no people in the image prompting the question: if nobody sees an HS2 train cross a viaduct, does it make a sound? The answer turns out to be interesting because the image, in fact, is a frame from a well-worked, computer-animated film of HS2 that you can see below – watch it on fullscreen for the complete HD effect. It’s very quiet isn’t it? Snaking through the landscape, barely even observable at some points in the film. When it gets to the viaduct segment at 28 seconds see how the surface of the canal gently laps and how the trees gently sway in a soft breeze. Perhaps a modern version of the question above could be formulated. If everybody sees the train silently passing over the viaduct on YouTube, does it make a sound? The other day it struck me what else the HS2 image reminded me of. It was thinking about the reflection on the canal that did it. 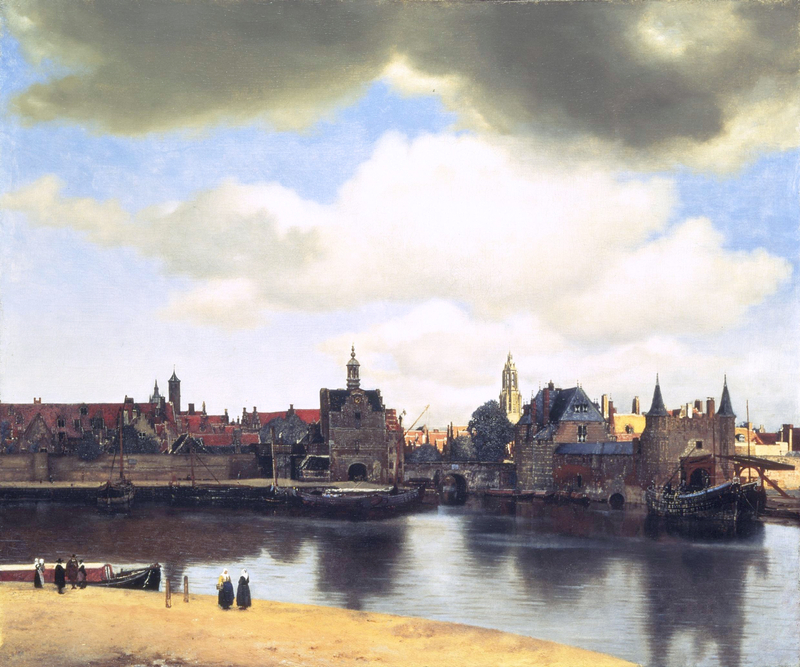 The image that was brought to mind was The View of Delft by Johannes Vermeer, painted in 1661 and shown below. Perhaps there is more of a relationship between the imagery of future infrastructure and Dutch landscape painting in the Golden Age than one might think? The painting has a similar sky to the HS2 image, though there are more clouds. A feeling of space in the painting is created, as it is in the HS2 image, by the reflection on the canal, where both Oude and Niewe Kerken (old and new churches) are both visible. Some years ago I regularly walked past the point where the View of Delft is painted from and often wondered about the painting and the reflection. Can one really see the townscape in the canal? (yes, kind of) Would the people really appear so small? (no) The perspective does indeed float a little, giving a feeling of, if not omniscience, then slight queasyness in the viewer (quite like a computer-generated model might in fact, though the HS2 image perspective is based firmly on the toe path). But the picturing in both cases – the frame, the sky, the water; the space – is similar, and strikingly so. Ten years ago, if there had been enough computing power to create and run it, the HS2 animation would have won awards for the subtle rendering of surface, the realism of the movement, and the quality of the direction. Today I just wonder how it is that our visions of the future are based so much on our picturing of our past? It’s almost like we’ve run out of ideas.